In this relatively light-hearted article, Adrian Burrows tells us about a new World War I military invention that never took off – Body Armor. The First World War revolutionized warfare on an epic scale. Cavalry became redundant against the machine gun. The deployment of metal monstrosities soon to become known as tanks forever changed infantry’s role in battle. The development of airplanes as weapons of war transformed the battlefield into a three dimensional arena in which military commanders had to consider all avenues in order to finalize their strategy, while the use of poison gas forever changed our ethical and moral standpoint on the rules of warfare. All of these factors meant that officers on both sides faced a never-ending tirade of considerations when thinking about how to defeat their enemies. However, this article isn’t about any of those military changes; this might make you wonder why they were written in the introduction to this article. To that I would give you this answer: tanks, airplanes and machine guns were all successful in their development and use but that doesn’t interest me at this moment in time. Rather, what I’m going to be considering are the military developments that were not successful. The ones that didn’t take off. The genius (and not so genius) ideas that almost revolutionized warfare… but not quite. First up, I’ll be looking at personal body armor. Quite frankly the headgear provided to soldiers at the start of the First World War was not fit for purpose. Some provided no protection whatsoever, such as the cloth French Kepi cap - which while it gave no protection to the head certainly made you look incredibly dandy. Other helmets made you a target, such as the German Pickelhaube helmet that had an easy-to-spot spike on top. The development of the Brodie, Stahlhelm and Adrian helmets over the course of the war cut mortality rates and assisted in reducing head injuries. So, some bright sparks considered… Why stop there? If a helmet is good, then surely covering a soldier in a metal suit would be even better! Or would it…? In the first picture is the Brewster body armor (named after its inventor Dr. Guy Brewster), developed by the United States Army towards the end of the war. Whilst it was very clumsy and heavy it could withstand the bullets from a Lewis Gun. Its problems occurred due to maneuverability being massively reduced and the small issue of the helmet not turning. This led to visibility for the soldier on the inside being zilch. This didn’t stop Dr. Brewster from excitedly telling America of his invention. But being a man of both action and science, Dr. Brewster didn’t just tell people about his invention, he demonstrated it. 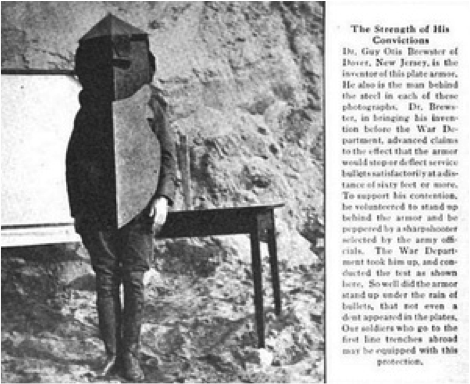 The picture below is of Dr. Brewster in his armor; the accompanying article describes how the American military tested his armor by shooting at the suit while Dr. Brewster was inside it. You would think that one or two shots would be sufficient to prove the protective qualities of the armor, but that was not the case for the American military. Its soldiers unleashed a ‘rain of bullets’ at the good Doctor. Apparently the military top bods were very pleased as no bullets penetrated the armor’s thick hide. I can only imagine that Dr. Brewster was very pleased about this too. At the end of the experiment Dr Brewster declared that being shot by a machine gun while wearing his armor was only about ‘one tenth the shock which he experienced when struck by a sledge-hammer.’ One has to wonder how he knew what it felt like to be hit by a sledgehammer. Brewster Body Armor as shown in the article. Unfortunately for Dr Brewster, his body armor never took off. This has always struck me as a shame, for after all, surely the Brewster Armor was a precursor to a real life Iron Man suit (and let’s face it, we’ve all been waiting for one and the fact that’s it’s 2014 and nobody has invented it yet is terribly disappointing). Clearly the Brewster armor was unsuitable for the requirement of life in the trenches and warfare across no-man’s-land. Yet there is still some fascinating theorizing that suggests that if body armor was provided to soldiers then thousands of lives could have been saved. The majority of injuries to soldiers in the First World War were caused by shrapnel to the chest and head. Surely then, if a soldier could protect these areas their chances of survival would have drastically increased? The Brewster Armor was absurd in many ways yet at its core Dr. Brewster had a very positive desire - to keep soldiers alive. Alas, over the four years of the First World War, very few developments were made in the field of body armor; it took some two years for most soldiers to get a metal helmet rather than a cloth cap. Perhaps if someone had managed to design and mass produce effective body armor then hundreds of thousands of lives could have been saved by the end of the war. Adrian Burrows works for Wicked Workshops, an organization that brings historical workshops to primary schools across the UK. They are currently doing many workshops about World War I. Click here to find our more about this great organization. Want to read more about an unknown aspect of World War I? Click here to find out about the underground battlefield of WWI tunnel warfare.